We’ve all been there – wondering past the car lot showroom, hoping our lucky numbers are coming up to make that dream of owning a lustworthy supercar a reality. But if you’re still dreaming and no closer to that heart-pumping Bugatti, don’t fret! When a remote control car like the Traxxas Ford GT 4TEC 2.0 4WD will cost you as little as £350, rather than the cool £80k the real deal would, an RC compromise suddenly doesn’t feel all that bad a deal. Want to become a Formula 1 driver in a day? Here's how to do it. So, which is the best remote control car for you and your family? Are you looking for some off-road, monster-trucking action? Some rubber-burning, tarmac-chewing supercar madness? Or a kid-friendly roadster to whizz around the living room? If you want to stay competitive at your local RC racing club, you’ll be slipstreaming towards something like the drifting FTX Banzai 1/10th Scale 4WD RTR Brushed Electric Street Drift Car. 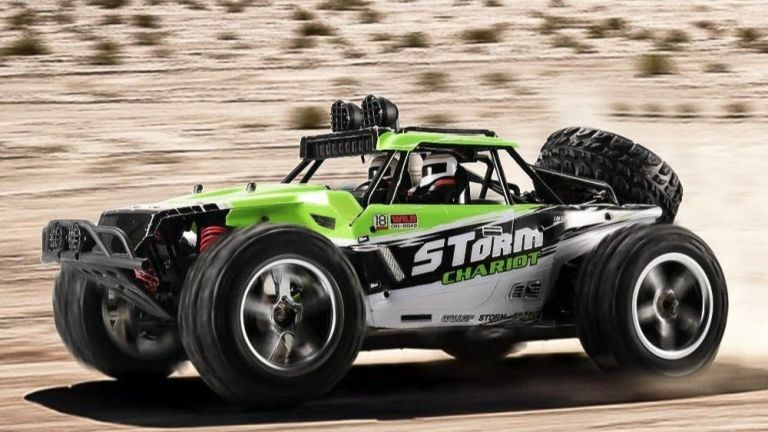 If you’re setting your sights on heading to the rough terrain of an off-road track, a buggy like the Vatos Off Road High Speed Car should see you keeping the pace. Whatever you’re after, our best remote control cars round-up will have you covered. And, when you’re ready to jump up to the big leagues, be sure to check in with the British Radio Car Association for the stuff to make true petrol heads swoon. Fully assembled and ready to race, the Traxxas Ford showcases the sleek and powerful design of the real thing. Traxxas have taken every care to include all the finer details – from the tail lights to the exhaust tips – and you can choose from a range of flashy colours including Liquid Blue, Liquid Red and Liquid Grey. The car will come to you ready to race, but bear in mind you’ll need to purchase the battery and charger separately. Thanks to the TQiTM 2.4GHz Radio System, XL-5® Electronic Speed Control and Titan® 12T 550 motor, we're pretty sure you'll have a great chance of a result on the track. Holy DIY dream drive, Batman! Lego and the Dark Knight have been a match made in heaven on more than one occasion, and this RC Batmobile is no different. From the mean streets of Gotham to the carpets of your living room, this Bluetooth-controlled racer (once constructed) makes use of two motors and four-wheel drive, and is armed with two dual-stud shooters to take on a villainous Lego minifig rogues gallery. Taking its cues from the 'Tumbler' Batmobile in the Christopher Nolan films, it’s a great gift for kids, letting them get creative with the Lego build options, while also giving them something fun to race with once all those blocks have clicked together. The Penguin won’t know what hit him. This really cool off-roader won’t set you back anywhere near as much as our first pick, but then it’s not a showpiece. If you really want to drive your remote control car, then this Vatos shouldn’t fail to meet expectation. We’re talking 40km/h top speed, three stage differential gear, an independent suspension system and rubber tyres to withstand hours of off-roading. Best thing is, the battery lasts up to 40 minutes, giving you way more play time than the smooth machine up top. The FTX Banzai is a fantastic entry-level option. It comes 99% complete in the box, but there’s enough for you to play around with to feel like you’re really optimising this car’s performance when you’re out on the track. It’s the drifters that want to take note here; we’re not saying it’s going to be easy to get the hang of, but once you do, and you familiarise yourself with the adjustable suspension system and shock absorbers, you’ll be the smoothest racer on the track. With a max speed of 30km/h the TOZO really goes, even when you’re off roading. It gives you 20 minutes of drive time, and with a 2.4Ghz Radio System, you’ve got 50m to play with when it comes to exploring the area. When you’re powering over rough ground, the independent shockproof system should prevent any potential damage caused by vibrations, while the three stage gear system ensures you can make the most out of the terrain. There are faster cars on this list. There are more powerful cars on this list. There are arguably cooler cars on this list, too. But are there any that bring as much pure joy to kids? Based on the hugely popular character from Pixar’s Cars, the Sphero Lightning McQueen is quite unlike any other RC car you’ll have seen before. Controlled by an app steering wheel over Bluetooth from your mobile device, it’s as much a robot as it is a child-friendly racing machine. The spitting image of the emotive character from the films, the racer features animated eyes (through an LCD windscreen) and a moving mouth in its bumper, alongside reactive suspension that lets it move like a living thing rather than your standard static car. Shouting out catchphrases as it drifts around corners, it brings Lightning McQueen to life in a way no other toy could manage. And, with a comfortably brisk top speed of 6mph and a 30m range, it’s the perfect entry point into the world of RC cars for your youngsters. Love Lego? Love racing? Can’t decide what to do on a Saturday? Do both! Combine your loves of both Lego and remote control cars with the Lego Technic. Choose between building two designs– the sporty looking traced racer or the RC Off Road truck– and take it off road, where you can spin it, turn it and clamber over obstacles. You can drive forward, backward, left and right and perform 360 degree spins. Why not build your own obstacle course? And you can even race it with its speedy motor. You can pipe dream about owning a real one, but when it comes to it, this replica, sadly, is about as close as you’re going to get. With an RRP of just under £30, this is great first remote control car and with its xenon headlights, working rear lights and a decent max speed that should offer just the right blend of exhilaration and control, it will give you some serious kudos when you’re racing your mates, too.